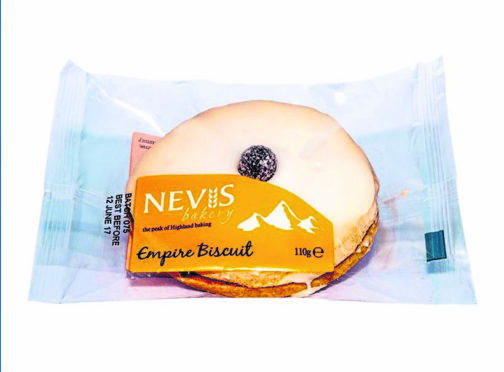 An Empire biscuit from Nevis Bakery in Fort William. A north bakery has said it takes “full responsibility” for a labelling omission after a four-year-old boy had a severe allergic reaction to one of its biscuits. Nevis Bakery, based in Fort William, was fined £6,000 and ordered to pay more than £3,000 in fees after pleading guilty at Belfast Magistrates Court this week. Stephen Bingham, the father of Joshua, a four-year-old from County Down, told the court his son had a severe allergic reaction to an unlisted ingredient of egg in an Empire Biscuit, sold by the company. The Belfast Telegraph reported that Mr Bingham said his son could have died if he hadn’t been carrying an Epipen. He said that both he and his wife had checked the label for the ingredients, but eggs were not listed. The incident resulted in a UK-wide product recall and the biscuits were removed from sale in shops. On Tuesday at Belfast Magistrates Court, Nevis pleaded guilty to failing to provide information on an allergenic ingredient – namely eggs – on its Empire biscuits. A statement from the bakery read: “We take full responsibility and accountability for this unfortunate incident and wish to sincerely apologise to the family involved for the distress caused. “Whilst we do not in any way wish to minimise the severity of the issue, it arose as a result of a small change in recipe that was not immediately updated on packaging. “When we became aware of the incident, we took immediate and effective steps to deal with the matter and have implemented procedures to ensure full compliance and safety going forward. “We have fully engaged with all agencies, including the Food Standards Agency and Allergen UK, and we wish to reassure our customers that we have taken this incident extremely seriously and can guarantee the future accuracy of our product labelling.